It was a horrible sunny day and i had preplanned a trip on the river with my very good friend, Mike France. By the way, you read that right, a horrible sunny day. With the kids off school next week and temperatures pushing 20 the water ways would be horrendous, so making a well thought out decision, we decided to fish a section of the river surrounded by high banks and hogweed, that's sure to keep them away. It was a decision that would prove to be the correct one. We stood on the bridge and looked at our potential swims, with no rain for a couple of days and visibility in the water good we would have to plan our tactics and swims carefully. We spotted a nice deep run which i usually fished from the near bank but with the water down and clarity good we spotted a crossing point which would allow us to fish it from the opposite side of the river. We both set our rods up, still using the redington till the tip arrives for my rod, and funnily enough we picked the same tactics and even the same length by a inch or so. Klink and dink was the tactics, low summer water, tonnes of snags keeping the fly moving with the klinkhammer would allow the fly to avoid as many snags as it would stay off the bottom in the pools. Our only difference was leader length, i'd chose an 8 foot leader in the hope of covering any rises, it meant i had less contact with the nymph, but as i had fished this section before i had more success at range than close quarters. We fished as a pair, taking it in turns and i was casting 20 foot or so across several flows meaning i had to put a mend in the line to avoid drag setting in as quick. It soon paid dividends and i was into a nice trout, after a quite a length fight for it's size it was in the net. The multiple currents and determination of the fish dragged the fight out. The trout had interesting markings, almost absent of spots on its back. It was Mikes turn to fish and he was quickly into a trout himself, his was much smaller but within 15 minutes of starting we had both avoided a blank. I was back in the hotseat and i continued to fish the far bank, a deeper greener pool under a tree, and it proved effective again, another nice trout and it was in the net quicker than the first. An interesting thing to note was the huge dent in the trouts back that once would of been a gaping hole and had now healed almost perfectly other than the dent in the trouts back. Some of these trout have done so well to have survived and it is a pleasure to catch them! Swapping places with Mike and again he was soon in, again a small trout but this time it didn't want netting. Heading up to the bridge pools i allowed Mike to fish first in the hope of him getting something bigger but after a good 5 minutes of nothing he allowed me and i was in first cast. His decision was made and he changed to a fly that resembled my own as much as possible. I had my ginger quilled nymph on again. As Mike changed flies he allowed to fish the pool and i was into a bigger trout, trying to keep it from going downstream into the riffled water it jumped once and the hook popped out. Unfortunate but fun either way. I fished the rest of the pool with no success so headed towards the second bridge arch, Mike in lead chose to fish a very small pool on the way which produced two small fish in quick succession, a sign of a good fly change. The second arch proved uneventful and even when i fished it nothing was interested. There would be fish there just something didn't quite look right for them to take the bite. We headed upstream, avoiding the rougher water as it had proved unsuccessful downstream and fished the slipstreams instead. It was quite shallow and the only deeper section again proved uneventful. Above was a complete change in water, a wide glide of water that seemed motionless however it carries a fair speed but lacks surface breaking rocks to create any slack water. One trick i use on this is to cast 20 or 30 feet in front and try to aim for the deeper channels and sunken rocks, the channels are dug out by the current flowing around larger rocks adding cover to a exposed section of river. It proved effective as at the back end of the drift i got a take and was into a nice trout. It fought well and as it tired it started to swim around me, almost wrapping round my stick at one point and even aimed between my legs but it was eventually in the net and it was a nice 1lb 1/2 or so, plenty of girth on these trout. Again this trout had a noticeable mark with a v like mark near it's back end and chunk out of it's gill plate leaving the gill exposed near the back. This fish had survived it's attack and with the amount of goosanders i seen earlier in the season, as well as the two that flew over us, it shows that they are capable of avoiding capture. I allowed Mike to take lead as we headed upstream, fishing around the old sleepers that held the weir to the paper mill back in the 17th Century. I had lost the big trout here last time when JT came on a prospecting trip but today it seemed too quiet. It was interesting that alot of 'fishy' water was not providing the expected fish. We knew they would be there but something just wasn't right to initiate a take. I headed slightly above the weir onto what is now a huge section of segmented bedrock. Ankle breaker bedrock, with it's segmentation the cracks between each section were deep and wide so any wrong step would cause some damage. As i stood watching Mike i spotted a nice greener pool on the far bank near a tree, it seemed the only section that wasn't bedrock as i cast a good 30 feet across the currents to it. The sun was on my back and with good water clarity fishing parallel had to be done from a distance. Both me and Mike had done alot of casting off the opposite shoulder today, it seemed to work better with the current and with the tree on the right hand side, a cast from the opposite shoulder allowed the line into the pool with less risk of snagging a branch. As i got to the far side of the pool a large trout popped out from behind the rock and went up towards my dry i struck as it went up towards it but half way through the strike it went back down, i paused for a fraction of a section and continued with the strike, it was on. I can only believe it had come up for the dry and switched to the nymph as it felt the current. It looked big but it was hard to tell, it dropped into a channel of deeper water in front of me and i glimpsed a sight of it, it was a nice trout, how big i was unsure as it could of been 3 or so feet down in the channel, difficult to tell size when clarity is this clear which gives misleading sense of shallowness in deep water. I shouted to Mike saying i wanted to keep it here, in front of me and avoid it going downstream where i lost the big one last time, it seemed a good idea however the trout had other plans. I kept it in the pool for a little bit, it was slightly getting pushed back with the current and i was aware of my line strength so didn't want to fight the force of the water and the weight of the fish to much, as it drifted back it started to come to the surface and it took a big jump. That was when we saw it's size, it was easily 2 feet but it had a big thick round body, it was a cracking trout, however now it had jumped it was out of the deeper water and it started to panic. 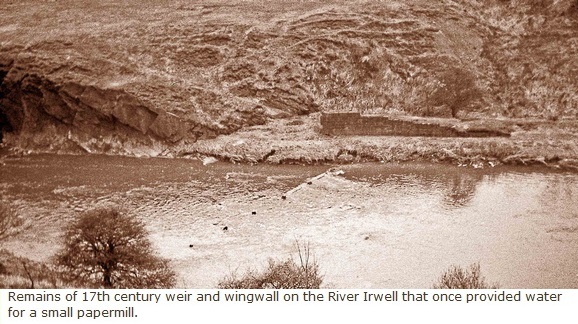 It shot across to the opposite side of the river following one of the cracks in the bedrock and as it shallowed off as it near the bank it turned and shot back across, as it reached the deeper channel it turned downstream towards the old weir and pulled the hook out. The sheer force and weight of it's run had caused the elasticity of the line to ping the hook out. I was left with a single scale from it's mouth on the hook. I laughed and screamed at the same time, the adrenaline still pumping through me as my brain ran through 100 different things i could of done, but it did the one thing i was trying to avoid, heading downstream. It was an epic fish but a great moment to share with Mike who has seen me come on leaps and bounds since we first met. After everything calmed down we headed upstream, the pools here were nice, deeper and with a current running through but again this water seemed lifeless, something we was doing in these more flowing sections wasn't quite right, maybe our nymphs rode to high in the water for them to risk cutting across a few feet of moving water. In all it was a great short trip, we had learnt alot and had some good fish. Fortunatly i didn't lose my fly as i only had one of them tied, back to the vice i go to tie a few more 'ginger nuts'.